Jane H. Kesson in the classroom. From a display at a memorial gathering. As a Philadelphia Orchestra subscriber, volunteer, and donor, Jane H. Kesson was a well-known figure at the Kimmel Center and, before that, at the Academy of Music. 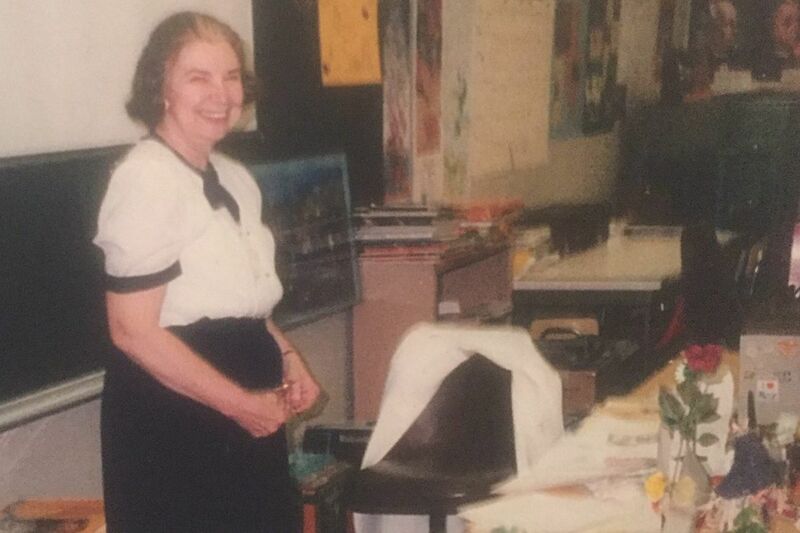 And so when the retired Abington-area music teacher died in 2017 at age 90, it came as no surprise that Kesson had left something in her will for the orchestra. No one, though, had anticipated the size of this something: $4.7 million. The orchestra announced it last month as a "significant" gift, and has now disclosed the figure. "I was flabbergasted," says Cindi Pasceri, a friend of Kesson's for nearly 40 years and executrix of her will. "She didn't live like that was the way it was," she said of Kesson, who remained in the same Wyncote house where she and her parents had lived since the 1950s. She understood both music and money. Kesson was the only child of a music-loving mother who recognized her daughter's talent and began piano lessons early, and a father who worked for Sears from whom she learned about investing. "She was just an astute investor, absolutely amazing," Pasceri added. "Even until the day she died, she knew exactly when her CDs were due" — certificates of deposit, that is. "She loved the orchestra from the time she was 12," Pasceri said. She lived with her parents until they died. Pete Checchia / Philadelphia Orchestra. Young listener-participants at a Philadelphia Orchestra concert for schoolchildren at the Kimmel Center. Gifts of this size are transformative, says orchestra president and CEO Matías Tarnopolsky. Not only are they a "fundamental injection of much-needed resources into the work of the orchestra," he said, but also a "wonderful vote of confidence" in the generations of work the orchestra has done in its education and community programs. Kesson's only stipulation was that $200,000 of her gift go into the orchestra's endowment, and it has. The rest the orchestra has used to close what might have otherwise been budget gaps in the operating budget for fiscal years 2017 and 2018. "A godsend" is what orchestra chairman Richard Worley called Kesson's gift in comments at the orchestra's annual meeting last month, adding that it helped to balance the budget. Last year, only 37 percent of the orchestra's annual $50 million budget came from ticket sales and other earned income. The rest was covered by donations (48 percent) and investment income spun off from the endowment (15 percent). Kesson's passion for music education was clear when, at age 13, she began teaching neighborhood children in Wyncote (at 50 cents per lesson). She attended the University of Pennsylvania, and earned a bachelor's degree in piano and a master's in composition. Her thesis was on American composers Henry Cowell, Aaron Copland, Roy Harris, and Charles Ives. She became a K-12 music teacher, working mostly in the Abington School District. But music was never just a job for Kesson. "It was almost like she was married to the music. Music was her life," said Mark Henkels, who had Kesson as his music teacher at Glenside-Weldon Junior High in the late 1960s. "I didn't totally understand it at the time, I just felt it. She just somehow could relate the music to you, whether you were playing an instrument or not." Henkels — a musician himself who now owns DeLuca Music Co. in Hatboro — remembers Kesson sitting at the piano, playing through and explaining Beethoven's Symphony No. 5. "She made a big thing about it, she made a story about it, how he couldn't even hear the music he had composed but knew what it sounded like. Everything she did was to demonstrate the fun of music, the beauty of music, the art of music. She just connected, and I know a lot of students felt the same thing." Henkels thought about Kesson a few weeks ago when he bought tickets to see Carmen at the Metropolitan Opera, "and that was the first opera Miss Kesson turned us on to. She said it was probably her favorite and it was a great introduction to opera, because of the melodies and the story behind it." "Anyone who went through that junior high knows Carmen," said Randy Faulkner, a wealth adviser in Perkasie who had Kesson as a music teacher around 1970. "The running joke at the school district was that every few years they'd want her to change what she taught, and she said, 'Fine, but I'm teaching opera this year.' "
The songs she led had staying power. "Sometimes they just come to me when I'm in the shower," said Deane W. Creighton, a Hatboro tax preparer who was in Miss Kesson's choir at Glenside-Weldon in the late 1960s. "She taught us so many little songs. And obviously the opera stuff. Really the only exposure I ever had to music was her. She just somehow attracted people's attention. Her personality was very magnetic. She loved what she did." Kesson retired in the 1990s but kept taking students to the orchestra — sometimes hundreds per year. "The orchestra was everything to her — the musicians, she adored them. She got a Christmas card from [orchestra concertmaster] David Kim that she framed," said Pasceri. So important was the institution to her that it was the largest of only three beneficiaries in her will aside from personal gifts (the others were Temple University classical/jazz station WRTI, and WHYY). To anyone who knew Kesson, this might not come as a great surprise. "For some people, music is such a part of them that you can't distinguish the person from the music. They are just an extension of the music," says Henkels. "And she was one of those people."